Brazil is a mess right now. Its economy is in recession, its currency is plummeting and its president, Dilma Rousseff, has the lowest approval rating -- 8% -- since another president was impeached in 1992. American credit rating agencies have rated Brazil's debt one step above junk territory. And everyday Brazilians are suffering as the currency's value is falling fast. Brazil's currency, the real, has fallen 24% against the dollar this year to its lowest point since 2003. Many of Brazil's problems stem from the widespread bribery case of the state-owned oil company Petrobras. The story has engulfed the country and hurt the company, which is a huge contributor to its economy. China isn't helping either. It's Brazil's biggest trade partner, and its slowing economy is making Brazil's commodities -- the engine of its growth -- lose value fast. This Sunday, a Brazilian nonprofit is organizing a mass protest, in part calling for Rousseff's impeachment. Protests are scheduled in every Brazilian city, and across cities in Europe and the U.S.
"The problems that Brazil's economy is facing have likened into a perfect storm," says Brian Winter, vice president of Council of the Americas. This Sunday's protest could likely be the largest during Rousseff's administration, he said. Here's more detail on Brazil's laundry list of losses. Brazil was once the poster child of booming emerging markets. Its economy grew three times faster than the U.S. economy in 2010. But today, it's economic growth is worse than Greece's. A. The drop in commodity prices is really hurting Brazil. Oil prices have plummeted since last year. The price of two major Brazilian exports, sugar and coffee beans, are down 34% and 25% from a year ago respectively. B. Its biggest trade partner, China, is slowing down, devaluing its currency and struggling to manage its market correction. That doesn't bode well for Brazil, which needs healthy trade partners. 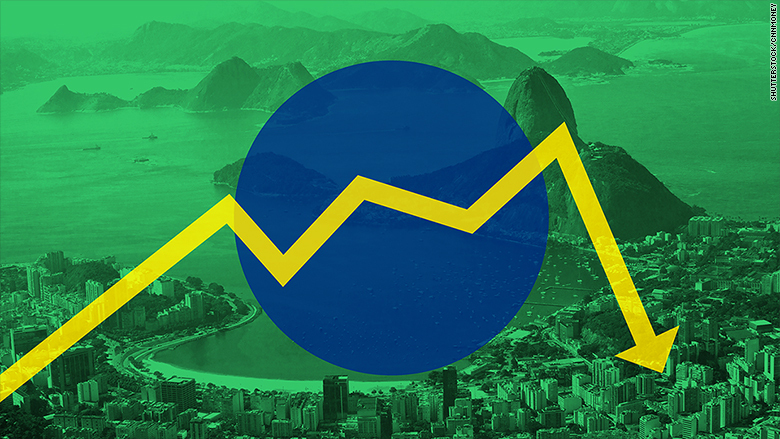 The Brazilian economy will shrink 2.3% by the end of the year, according to Bank of America (BAC) Merrill Lynch estimates, which were revised down. The bank is also calling for a recession in 2016 when the Summer Olympics come to Rio de Janeiro. Brazil is paying for mistakes it made during its boom years, says Winter. Its central bank lowered interest rates in 2011, making it easier for companies to get cash, or capital. That sparked inflation in Brazil, which is now rising by double digits. To combat inflation, Brazil's central bank is now raising interest rates. That increases the cost of business for everyone -- the last thing you want to do in a recession. "It's hard to find people right now who think Brazil's economy will grow in 2016," says Winter. Brazilians are accustomed to political corruption. But the scandal that's engulfed Petrobras, the state-owned oil company, has shaken the nation, rocked the economy and put the president at risk of impeachment. "There is no type of precedent for this type of scandal" in Brazil, says Gerardo Rodriguez, head of emerging market multi-asset strategy at BlackRock. "Just during the past two or three months, the level of [political] uncertainty has gone up quite dramatically." These kickbacks weren't chump change either. Petrobras lost $2 billion in bribes over the years. The things is Brazil needs Petrobras to succeed. The company alone accounts for 10% of economic activity in the country, not including all of the other businesses, like construction and transportation, that it supports. Petrobras' stock is down nearly 50% from a year ago. Related: Is Argentina pulling a tango turnaround? It's not just China causing Brazil a headache abroad. Things could still get worse in September. America's central bank, the Federal Reserve, could raise its interest rate in September for the first time in almost a decade. An American rate hike tends to make investors pull their cash out of emerging markets like Brazil. Higher rates in the U.S. mean investors can get higher returns for their cash. That lowers investors' desire to look abroad for riskier, but higher return bets. Correction: A previous version of this story misstated the value of Brazil's currency, the real, against the U.S. dollar. It has lost 24% since the beginning of this year, and 35% over the past 12 months.